Learn more about our low-cost gifts with unheard of profit margins. Three steps to "prove to yourself" the quality and viability of this opportunity. Read this opportunity page in its entirety. Share your sample with trusted friends and family, and ask if they would consider buying this type gift. That is usually all it takes: In fact, many of our new customers call asking how long it will take to receive their start-up kit because they already have orders after showing their sample gifts to others! Before investing any money whatsoever. Creating Personal Touch gifts can be one of the most rewarding things you will ever do. If you choose to join us, you will be providing a unique line of thoughtful gifts and keepsakes that meet the vast demand for personalized gifts in the marketplace. You will be actually be providing a much-appreciated service to your customers, friends and family members who will appreciate having found a solution to the never-ending burden of finding appropriate gifts for all of their gift-giving occasions throughout the year. You will meet that need by creating thoughtful, cost-effective gifts for your customer's special occasions in a matter of minutes. And you can expect to enjoy what you do while earning a handsome profit at the same time. Love is a powerful word… It is not an exaggeration to suggest that your customers, friends, and family will absolutely love the gifts that you will create for them. And it is not an exaggeration to suggest that aside from the financial rewards, you will experience the personal reward that comes from creating the perfect gift for your grateful customers. If you're at all like me, you've researched many so called opportunities in the past. And maybe even tried a few that made false claims and promises that you hoped, but intuitively knew could not live up to their promises. First of all, let me say right up front that we do not fall into that category. As the owner of Personal Touch Products, I set the tone for my company, and you will come to see that we are more likely to under-promise in our desire to exceed your expectations than over-promise something we cannot deliver. With that in mind, I ask that you do your due diligence by reading the entire “opportunity” page, after which I can assure you that you'll have the knowledge you'll need to determine if the Personal Touch Opportunity is a good fit for you. Feel free to call or email me personally with any questions. Join us as we reach out to the world with our thoughtful and encouraging personalized keepsakes! Earn realistic profits from 300% to 5000%. No royalty or franchise fees. Based on a simple process that takes 2 minutes. Perfect for extra income, full time or somewhere in between. Work with a trusted company celebrating 28+ years in the gift industry. BONUS REASON: Save a bundle of money with your own gift giving. You will have everything you need to create the perfect personalized gift for friends, family, showers, weddings, anniversaries, new babies, birthdays, holidays, etc. Create appropriate gifts and keepsakes for every possible occasion. And you can anticipate receiving an outpouring of heartfelt appreciation for the thoughtful gifts that you create for the special people on your list. Gifts they will remember forever! FINANCIALLY REWARDING: Create extremely low-cost gifts with extremely high-profit margins. Markups of 300% to 5000% + and a product line that provides you with everything you need to create high-quality personalized gifts for every possible occasion in less than 2 minutes! LOW START UP COST: No expensive equipment required. Use your Windows based computer and printer, and select one of our low-cost start-up kits from $249. RECOUP YOUR INITIAL INVESTMENT: Every start-up kit includes more than enough supplies to recoup far more than your initial investment. COMPLETE STARTUP: Using your computer and printer, and our exclusive Personal Touch software and supplies, you’ll have everything you need to create truly beautiful, high-quality personalized gifts that practically sell themselves. TAP INTO THE SPANISH GIFT MARKETPLACE: Gifts on Art software will allow you to create beautiful Spanish gifts too. No extra software, no extra cost. SUPER SIMPLE: No special tools and no special equipment and simple to use software. Create your first gift within minutes of installing your software. What printer do you recommend? You can utilize a laser or inkjet printer to create Personal Touch gifts. Perhaps the most important feature is the ability to print on cardstock paper. Personal Touch art backgrounds are pre-printed on acid-free, 65lb cardstock paper which is similar to the thickness of a thin business card. What special equipment will I need to create these products? You will need a Windows based computer and a printer. We will provide you with the software, art backgrounds, and personalized gift supplies. Are these products easy to sell? Yes! Personal Touch personalized gifts sell extremely well without any pressure or pushing. Can you think of anyone who would not appreciate receiving thoughtfully selected gift personalized just for them? The Personal Touch product line is specifically designed to meet the vast demand for quality personalized gifts. Precisely the type of gifts that you will create for your customers. Your job is to simply show your customers sample gifts, and help them select the perfect gift for their occasion. Due to the variety, quality, convenience and extremely reasonable prices, you can anticipate a following of grateful repeat customers. How long does it take to create a typical personalized gift? Approximately two minutes. While it may take your customer more time to select their gift, the actual time it will take you to create a typical gift is 1 or 2 minutes. 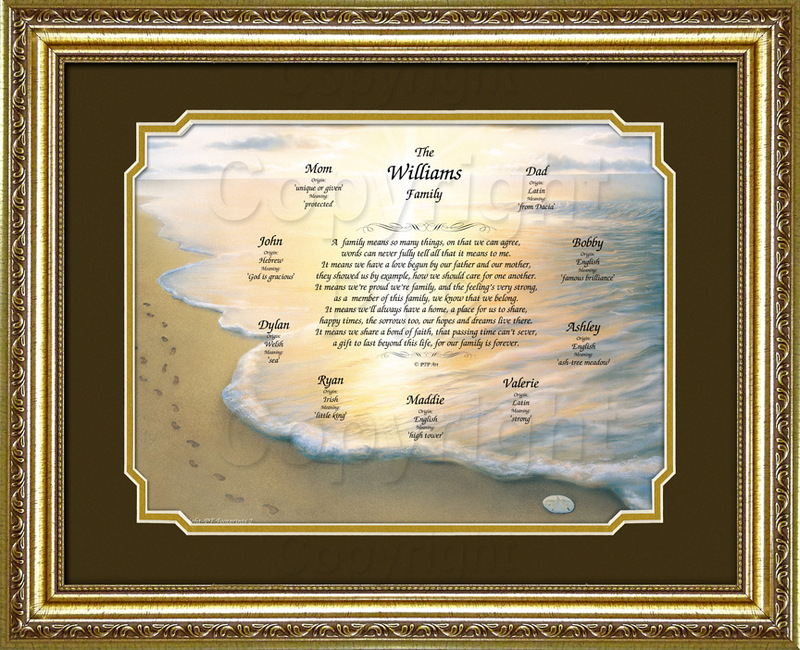 It may take several minutes more to frame a gift, or create family gifts with many names. Personal Touch will provide you with our exclusive line of pre-printed Art backgrounds, so you will never actually print the art backgrounds using your own paper. Personal Touch art backgrounds are pre-printed on acid-free archival quality lithograph paper designed for keepsakes that will last forever. You will never need to concern yourself with quality, consistency, waste, high printing cost or excessive time required to print the art backgrounds. With our simple gift creation process your personalized print-out will be completed within seconds after inserting the art background into your printer and pressing print. Can I create smaller gifts such as mouse pads, key chains, 5x7 frames, etc.? Yes, easily. 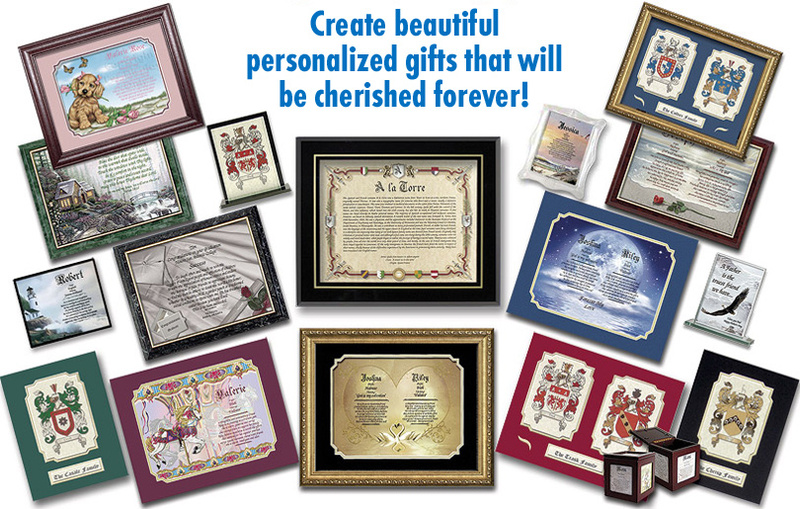 Personal Touch Software includes a special cut-line tool that allows you to quickly create smaller gifts of any size. Simply select the desired art background, insert a cut-line at the desired size, insert the desired text and press print. Trim the printout along the cut-line with a paper cutter or scissor, and complete the gift by inserting the trimmed to size print into the desired gift item. No glue, heat presses, specialty ink or transfer papers, and no expensive equipment required. Note: Offering smaller specialty gifts is not required to be successful, and certainly not required to get started. What kind of profit can I expect to make? The following examples can be used as a guide to determine your retail price and therefore your potential profit. The suggested minimum markup is 300% to over 4000% depending upon the item you are selling. Your local demographics will more accurately determine the actual selling price and therefore your actual profit. Where are the best places to sell personalized gifts? Is this a seasonal business? Is there a large market for Personal Touch gifts? The personalized gift marketplace is enormous and growing. And the Personal Touch opportunity allows you to create thoughtful personalized gifts for every person, relationship, and occasion. Appropriate gifts for men & women, boys & girls, young and old. Imagine for a minute how often people purchase greeting cards for every occasion under the sun: special occasions, birthdays, holidays, anniversaries, weddings, new babies, graduation, Mother's Day, Father's Day, love, friends, and family, thank you, recognition, inspiration, and bereavement. The list seems endless. Now imagine you'll have everything you need to provide high-quality keepsakes for those very same occasions at very reasonable prices, that cost you pennies on the dollar! I hope you can see the potential. Continuing with the greeting card analogy, there are of course significant differences. Although greeting cards can be very thoughtful and greatly appreciated, more often than not they wind up in the trash, while Personal Touch gifts are suitable for framing and designed to be kept forever! Can you give me some idea about how this all works? You will need a computer and printer. We will provide you with everything else that you need including our proprietary software, art backgrounds and personalized gift supplies that will allow you to create personalized gifts quickly and easily. Your customer selects the art background of their choice. Using the Gifts on Art software, you will select the art background and it will display on your monitor. Search for your customer’s name, and it will display on screen with the art background. Add a sentiment or personal message if desired. Insert the pre-printed Personal Touch “art background" into your printer and press PRINT. That's it! Your Personal Touch Gift is complete and ready for framing! How long does it take to learn how to create the gifts? If you are reasonably comfortable with any word processing program you will be creating gifts within minutes of installing your Personal Touch software! Create amazing personalized gifts with Gifts on Art software. Designed with simplicity in mind. 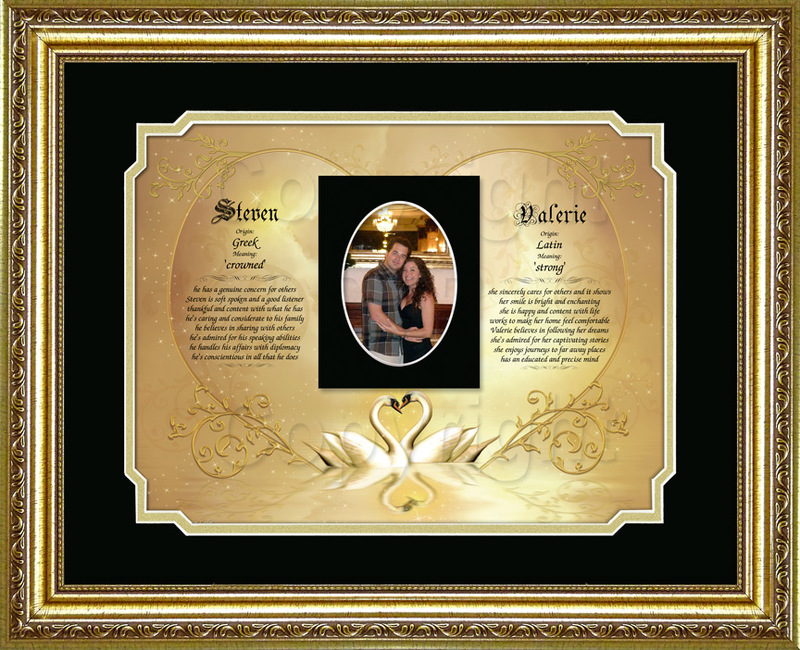 Quickly and easily create unique personalized keepsakes by selecting a beautiful art background and inserting any number of first name meanings, poems, quotes, verses and photos, all on one gift. Limited only by the amount of available space on the art background and your imagination. So simple and lightning fast! Create high-profit gifts in less than two minutes that cost you pennies. Create keepsakes that your customers will be so grateful to you for providing them with the perfect gift for their special occasion. First name meaning gifts are extremely popular and the easiest to sell. Everyone appreciates seeing their names in print, and that`s what this unique and interesting gift is all about! Gifts on Art software brings name meaning gifts to their ultimate potential by combining your customer's first name with it's meaning, origin and eight virtues associated with the name. This is a fun gift that everyone appreciates. Offering to look-up your customer's first name meaning for free is a great way to engage with your retail customers. Create first name gifts for every name in the world! Over 250,000 first name meanings in English and Spanish. Create name meaning gifts for unique names and nicknames with the click of a button. Editable name templates providing you with flexibility to edit the configuration settings for this gift. Lightning fast name gift creation with the least number of keystrokes. As quick as 10 seconds! Create name gifts that include the first and middle names with the origin and meaning for both. Flexibility to edit any part of the name gift including the meaning, origin, graphics and virtues. Combine any number of name meanings with poems, sentiments, photos, etc on the same gift. Each first name includes a unique set of eight virtues associated with the name that are designed to uplift and encourage the recipient. It is amazing how many people identify with the virtues, often sharing how they describe them perfectly. (The virtues are not at all like a horoscope, but rather positive attributes intended to encourage and inspire, so they are appropriate for all customers). Combining more than one first name on a gift is a very simple and popular personalized gift idea. Create name gifts for couples of all ages, or create a gift with 3 or more names. You can even create a first name meaning gift including the names for an entire family! We recommend charging and additional $2 to $3 for each first name meaning beyond the first name. Create thoughtful personalized poetry gifts for every occasion. Gifts on Art software includes over 200 thoughtful poems written in English and Spanish (over 400 in total), and are one of the essential ingredients required to be successful selling personalized gifts. Our exclusive modern-day poetry collection includes an appropriate poem for just about every occasion and relationship. Each poem is designed to be personalized to recognize a special occasion such as the birth of a baby, graduation, birthday, wedding, etc. Easily edit or add a sentiment for a special event or holiday such as "With all my love always, Valentine’s Day 2017". Your customer's personalization options are unlimited. And you can easily create custom poems for your customers or add your own poems to the program database. Click here to view sample poems. How many poems are included with Gifts on Art software? Gifts on Art software includes over 400 poems (200+ English & 200+ Spanish) covering 26 major categories, plus Special Occasions which can be personalized in a matter of seconds. 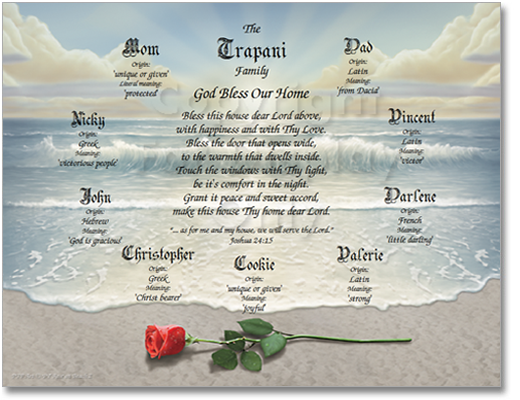 The "Family Gift" sample below combines a poem with the family's last name and first name meanings for the entire family. 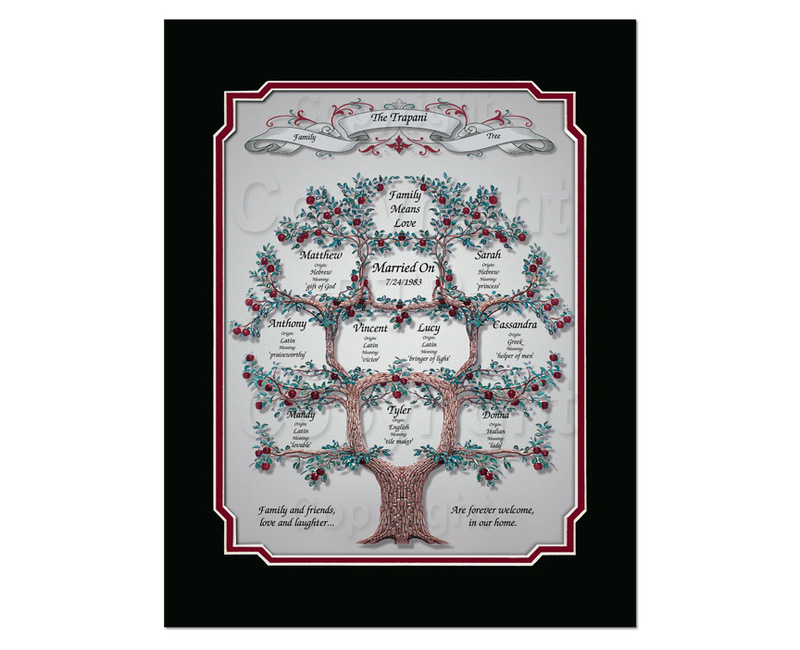 Create Family Tree Gifts in a few minutes. Despite gas being as high as it is, the economy in shambles or so the experts say... the bottom line is that our product sales from Sep.18th to Oct.12th; with only 14 days of selling we sold $10,309.72. Before we bought your program my husband was a builder I was a stay at home Mom and we never got anywhere with our finances, it was hard to get by. Now we are doing quite well we are not rich but we have what we need and want without relying on credit to pay for it. We work for ourselves set our own hours home school our kids and have fun doing it. We thank you for creating such a great money making product. It has definitely changed our lives. Just wanted to say how much I appreciate your taking time to talk with me and offer suggestions to make my business fruitful. 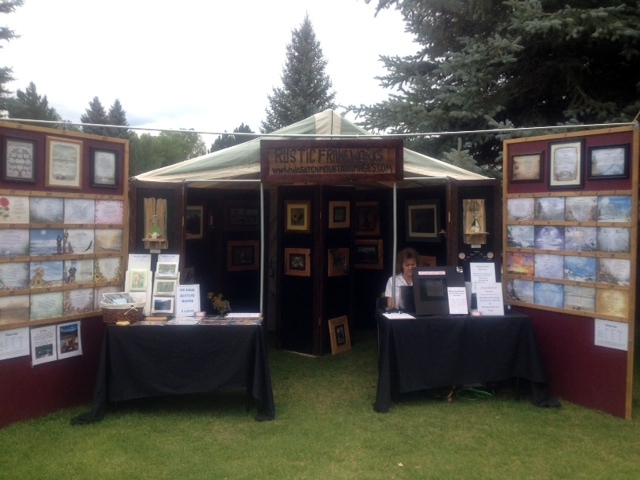 This past weekend, I displayed my product at a large craft fair and was awed with people's reaction to the product. Not only did I have a great weekend (took in close to $1000 for two 6-hour days - when no one else had any customers) and had the opportunity to meet new people. People were inquiring what shows I would be doing next so that they could follow me. Today, I had a call from one of the teachers at our local school that I made some prints for, and she asked me if I would be willing to do a few home parties - YES, YES of course, I will! I was thrilled to be asked. Then our local church asked me to do a Pastor appreciation plaque for this weekend - and the stories go on and on! Thank you so much for not only offering a terrific product but also for all the support and encouragement. Personalization has universal appeal: People around the world, young and old, male and female, appreciate receiving personalized gifts. That’s a given. And the proof can be seen in and the numbers. 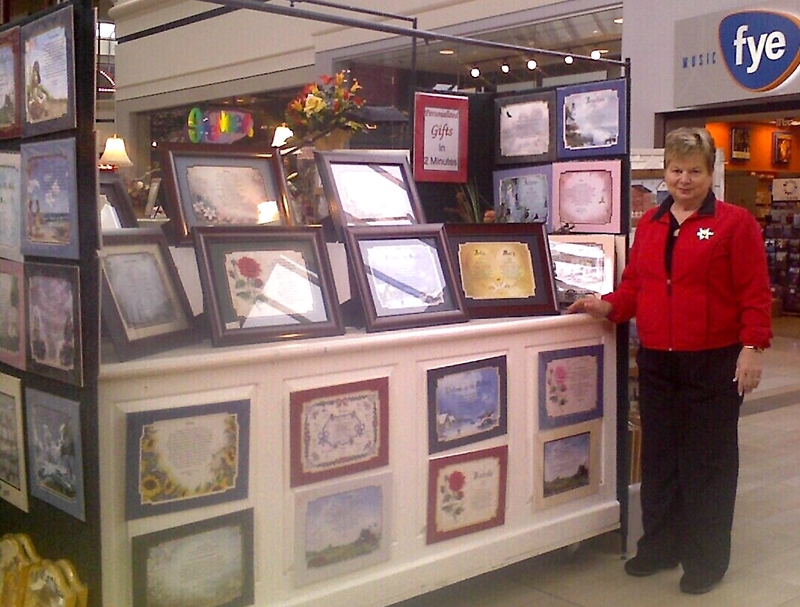 Our customers have collectively sold millions of Personal Touch gifts worldwide. Is this a passing fad? Definitely not. As a Personal Touch dealer, you’ll have everything you’ll need to build a loyal following of happy, repeat customers who love to give personalized gifts to the people they care about. High quality supplies: We offer you the highest quality supplies at extremely low prices. You`ll be able to create low cost gifts that anyone would be proud to give or happy to receive. You will be surprised by the outpouring of positive feedback you'll receive from your customers. Begin maintaining a list of customers so you can email them prior to the upcoming holidays. Flexible Location: Operate from home, retail location, or the web. From one or multiple locations. It`s totally up to you. The concept was designed to be portable, making it easy to move to set up at temporary locations such as fairs, flea markets, trade shows, farmers markets, craft shows, home parties, etc. Open a Personal Touch web-store whenever you’re ready to begin selling online. Flexible Hours: Full-time or part-time, weekends, year-round, during the summer, or just during the peak holiday seasons. There are no quota’s or minimum sales to meet, so the choice is truly yours. High profit margin: You will ultimately determine whether or not you sell the gifts for profit but with suggested markups of 300% to over 4000%, and more than enough starting supplies to earn back far more than your initial investment at suggested retail prices, the Personal Touch opportunity offers you an unmatched return on investment. A company with a solid reputation: Founded in 1989, Personal Touch Products' core values include providing our customers with the exceptional support and the highest quality software & supplies in the marketplace at the lowest possible prices. We truly care about our customers and that shines through everything we do. With an untarnished BBB record, we take our reputation seriously. The finest personalization software available: Personal Touch software is the most comprehensive, flexible and simple to use personalization software available, period. In demand year-round: Naturally, the holidays are the peak buying seasons for any gift-oriented business, but Personal Touch provides you with a comprehensive line of tried and true products designed for year round sales including for every occasion you can think of. From birthdays to inspirational gifts, new babies to weddings, anniversaries, retirements, bereavement gifts, friendship and love oriented gifts, gifts people buy for themselves, and everything in between. A truly enjoyable opportunity: If you have the heart for making people happy, then get ready to wow your family, friends, and customers with thoughtful gifts personalized for their special occasions. Designed by your customer, and created by you less than two minutes while they wait! A truly simple, cost effective and enjoyable service that you can provide to everyone. Each kit includes more than enough supplies to earn back far more than your initial investment, and you'll have everything you need to begin creating the most popular personalized gifts for your family, friends, and customers. There are absolutely no franchise, royalty fees, or quotas to meet, and you decide exactly where, when and to whom you will provide your personalized gift service. Feel free to contact me if I can assist you in any way. If we’ve peaked your interest and you are prepared to get started, request a sample so you can see first-hand the type of gifts you can begin creating within minutes of receiving your start-up kit. Share your gift with trusted friends, family, and potential customers so you can catch a glimpse of the positive feedback you will receive.